Here are a selection of front and back door handles in common use today in Ireland and elsewhere. They are on external doors and used with the type of lock that requires the handle to be lifted upwards before the key can be turned to lock the door. These handles come either with a built in spring of without a built in spring. There are many sizes and many finishes available, the main colours in common usage are gold, silver, white and black. Other finishes available are polished brass, brushed chrome and polished chrome. These handle are commonly used on wooden, PVC, Aluminium and composite PVC and wood effect doors. centre of the keyhole. The measurement will typically be 70 mm or 92 mm. 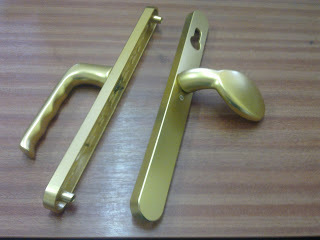 Call me 021 4883131and I will send you the handles you need to replace anywhere in Ireland with no bother or fuss. 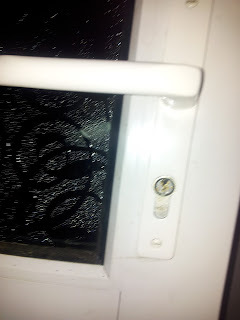 Have a look at my web sites www.handlesupplies.com or www.emhardware.ie There has never been a case where we failed to replace a lock or handle with a suitably fitting new version, even when a lock or handle is obsolete we can offer you a newer model replacement that will fit you door. 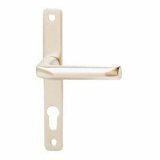 White door handle with 2 screw fixings this pair of handle has 180 mm between the screw fixings and 70 mm from the center point of the handle to the center point of the key hole. We sell every make of (multipoint) lift to lock type of (long strip) door locks and every type and size of barrel (cylinder) lock and keys as well, so get in contact without delay, we are glad to offer fitting instructions. Call 021 488 3132 or email handlesupplies@gmail.com for a fast efficient service. We are opened 6 days and week at Cobh Cross outside Carrigtwohill and we have more the 25 year experience in dealing with customers of every type and door locks and handles of all types. or arrange a fit ng service for you if required.